From the other side of the world, Clemson University’s Kendall Kirk can activate a fan on his grain bin in Blackville that could prevent thousands of dollars in lost crop value. Even better, the automated grain bin can sense an overnight dip in humidity while Kirk sleeps and shut off the fan to avoid over-drying the grain. The fan turns on automatically again if temperatures and moisture levels call for it. Kirk, meanwhile, can sleep soundly knowing the value of his grain is protected. “This bin is like a bank. 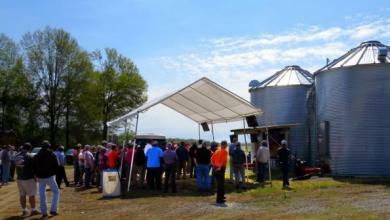 If you put $250,000 in your bank, you don’t want to come back in nine months and find $150,000,” Kirk told a group of farmers gathered at a field day at Clemson’s Edisto Research and Education Center this month. Kirk, a precision-agriculture engineer, is researching the use of automated bin-management technology that monitors bin temperatures, humidity and other factors that can damage stored grain. Automated bins also reduce the chance of accidents by limiting the need for farmers to enter bins to identify problems. The impact of Kirk’s project, which was supported by the state Legislature, can be great. South Carolina farmers sold nearly $500 million in grains in 2012, including corn, wheat, soybeans, grain sorghum and other grains, USDA data shows. Farmers store grain to hedge market prices, as well as to keep harvests on schedule even if freight transport is unavailable. But improperly stored grain can be damaged by mold, insects, condensation and other factors. Too much moisture can lead to mold, for example, while excessive moisture loss causes grain to lose weight and value. One Southeastern farmer recently lost $3 per bushel on his soybeans because of poor storage, said Edgar Wood of Palmetto Grain Brokers. That’s a loss of about one third of its value because the grain overheated. “It basically caught fire,” Wood said. By contrast, a soybean farmer who properly stores his grain from September through May could gain 70 cents per bushel by waiting to sell when the market was better, Wood estimated. “The market is going to pay somebody to store it,” Wood said. Around 85 percent of Southeastern farmers store grain on site, Wood said. Fewer than 5 percent use automated grain bins, however. “The manually managed grain bins will never be able to optimize grain shelf life the way an automated bin can,” Kirk said. Working with graduate student Dan Ulmer and agriculture engineering technician Richard Hallman, Kirk is evaluating automated bin storage to determine the cost effectiveness to farmers and to establish a monitoring system best suited to South Carolina’s climate. The state’s high temperatures and humidity make grain storage more challenging. Kirk also plans to work with growers to evaluate energy consumption of automated bin management systems with the hopes of reducing electricity costs. Kirk joined the Edisto Research and Education Center last year to help boost its precision-agriculture program that increases farm profits and reduces operating expenses and environmental impact. He also is developing peanut and hay yield monitors, a peanut digger that works at variable depths and some remote-sensing technologies for livestock management. Kirk put his automated grain bin system in place in October and continues to fine tune his system to aid growers. “We’re trying to expose growers to new technologies so they understand the advantages, the drawbacks and the costs,” he said. For more information, see this article at SE Farm Press.